The Spring Festival of India, Holi is a festival of colors. This is celebrated in the month of Phalgun (February-March) according to the Hindu calendar. Holi is one of the major festivals of India and is celebrated in most of the states of India. However, each region has its own variations of Holi with a large local influence. Although the festival originated in India and is still widely celebrated there as a religious festival, it has been adopted in many places around the world. Some of the biggest celebrations take place in the temples of Vrindavan, a town in the Indian northern state of Uttar Pradesh. According to legend, the Hindu god Krishna played Holi with his consort Radha. On the day of Holi, people throw colored powder and liquids at each other. The festival also symbolizes a new beginning for Hindus to end conflicts and let go of emotional impurities from the past. Along with variety of colors, people likes to enjoy variety of food as well. There are a lot of traditional delicacies that are relished on Holi festival for making the occasion even more enjoyable. Among all, thandai is a refreshing milk beverage specifically served during Holi. 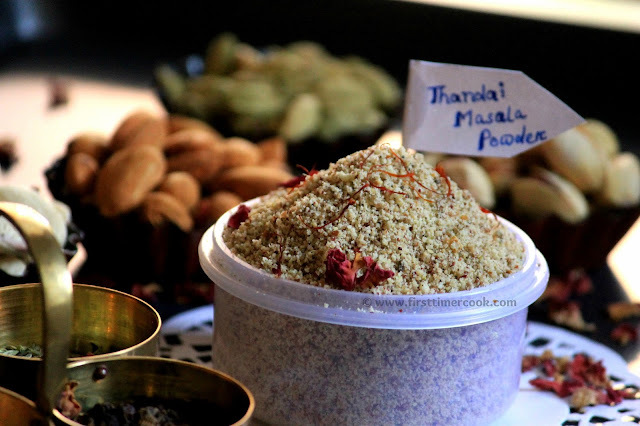 Thandai is mainly prepared by using a nut and spice mix powder known as thandai masala powder. 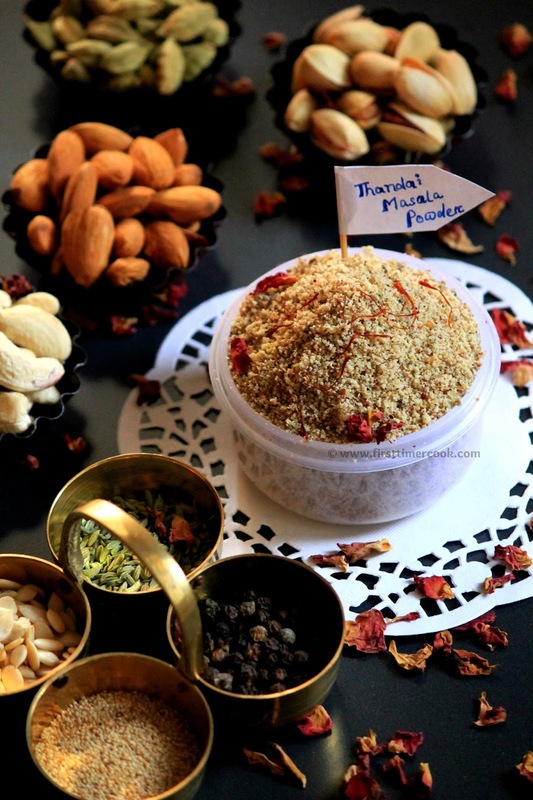 Basically the thandai powder is a semi-coarse or fine mixture of cashews, almonds, pistachios, melon seeds, fennel seeds, rose petals, pepper corns, green cardamoms, poppy seeds, saffrons and many other according to individual preferences. These ingredients present in the thandai even have a few health benefits. Fennel Seeds are full of antioxidants, anti-flatulance, and cooling properties. Pepper corn has medicinal properties that prevent the formation of intestinal gas, stimulate the production of hydrochloric acid in the stomach which helps in digestion. Peppercorn also promotes sweating and urination for removing waste from our body. Melon seeds are a good source of energy, protein and iron. Rose petals are rich in vitamin C,D,K and E and other organic acids like malic acid, citric acid and pectin which help in building a strong immune system, strengthening the digestive system and detoxifying the urinary tract and kidneys. Poppy seeds contain minerals like iodine, manganese, zinc, magnesium and copper. The presence of linoleic acid in poppy seeds protects the body from heart attacks and other heart disorders. Saffron has many therapeutic applications in many traditional medicines as antiseptic, antidepressant, antioxidant, digestive, anti-convulsant. Though associated with festivals like Holi and Maha Shivratri, thandai is a preferred cold beverage throughout summers in India. These days, anybody can get the ready made thandai powder or thandai syrup in market. But those are much loaded with sugar. So instead of using that, do prefer this homemade thandai powder. Instantly anybody can prepare and store for later use. 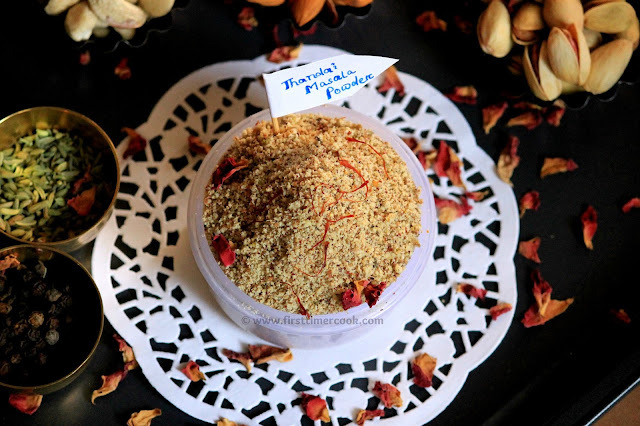 Using this thandai masala powder, one can prepare many other things like traditional thandai, thandai cheesecake, thandai rabdi, thandai lassi, thandai kulfi, thandai cookies, thandai cakes and many more. Some of these, I will share in my next posts, so stay tuned ;) .Below is the details method of preparation of thandai masala powder. In a pan, first dry roast chopped almonds, cashews, pistachios lightly. Transfer to a plate and allow to cool completely. In the same pan, again dry roast melon seeds. Soon these will start spluttering, then transfer to the nuts plate and allow to cool everything completely. Now take a blender jar and using a dry kitchen towel, wipe out the inside of the jar making sure that the jar is completely clean and dry. Next put all the ingredients listed along with roasted and cooled nuts and melon seeds in the blender jar. Then pulse to a fine powder keeping some gap in between pulsing. That means, don’t just put the blender on high and leave it to get the fine powder. Since nuts are being used so by continuously pulsing oil may secret from the nuts and also the perfect texture of the masala powder may not achieve. So pulsing for a few seconds, then checking the texture, then pulsing again will prevent any imperfect texture of the thandai masala powder. Now sieve the powder on a plate and again grind the coarse ones till everything sieved out. Finally using a clean spoon, put all the sieved powder into an air-tight container. Now the thandai masala powder is ready to be stored and used whenever needed ! This thandai masala powder can be stored for 2 months in an air tight box. Always pulse to a fine powder keeping some gap in between pulsing. That means, don’t just put the blender on high and leave it to get the fine powder. Since nuts are being used so by continuously pulsing oil may secret from the nuts and also the perfect texture of the masala powder may not achieve. So pulsing for a few seconds, then checking the texture, then pulsing again will prevent any imperfect texture of the thandai masala powder. The ingredient's measurements can be changed as per individual preference.